With more than 40 years of experience, Universal-Pack is one of the leading manufacturers of machines for the packaging of individual portions in “sachets sealed on four-sides“, “shaped sachets“ and “stick packs“. The company relies on high-performance, scalable Motion Control systems for the implementation of its concepts, which range from automatic sachet filling machines through to complete packaging lines, for a broad spectrum of commodities including foodstuffs, chemical and pharmaceutical products and cosmetics. 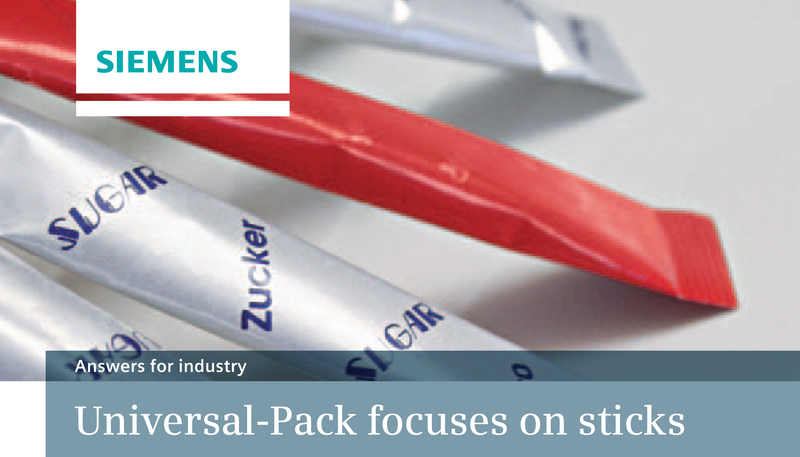 Universal-Pack was searching for a platform for the design of a new, fully automatic packaging line that was capable of packing a variety of products into “stick packs“, i.e. sachets containing single portions. The main objective was to produce a scalable system, which would enable the development and construction of both small machines and complete packaging lines. The Siemens Application Center in Bologna provided support for the implementation of the Motion Control system and the SIMOTION® application libraries. Universal-Pack also used Mechatronic Support to design and dimension the zero-play geared motors. Stick by stick on the ladder to success. • a chain conveyor to supply the empty cartons and transport the filled cartons to the sealing machine. Ready-to-use, tried-and-tested, easily adapted standard solutions were used in the form of open software libraries in an effort to meet the tight schedule. Already capable of realizing a large proportion of the motion functions, such as removing the foil or correcting the print mark, these offered a means of reducing the proportion of software actually developed in-house and the associated engineering for the machine to a considerable extent. The proportioning system is the heart of the packaging line, comprising eight independent worm feeders driven by Siemens 1FT6 servomotors. These servomotors enable the sachet filling machine to achieve optimum production speed thanks to their compact dimensions and high torque. At the same time, SIMOTION D controls the worm feeders individually and, with them, the amount of product filled into every single sachet. The PLC was combined with the system’s Motion Control technology, making it easier to optimize the motion sequences, as well as reducing the number of interfaces and the associated engineering costs. The combination offered a means of implementing all of the checking functions for the stick pack machine in a very compact construction and in a single intelligent controller. This architecture has numerous advantages, including its unique but flexible development environment and the ability to organize software in modules and integrate temperature control. SIMOTION D therefore assumes responsibility for all aspects of machine automation. Signals from the linked Siemens SIWAREX® CS weighing system are used to correct the filling process. Each stick pack is checked individually and placed in a carton by means of a “pick & place” function. This function is also performed by servomotors to ensure the necessary dynamic performance. The safety functions integrated into SINAMICS® S120 enabled Universal-Pack to utilize the Safe Torque Off (STO) functions certified in accordance with SIL 2 at a standstill, which led to substantial cost savings as a consequence of reductions in hardware and switchgear cabinet requirements. OMAC-compliant interface blocks for SIMOTION D lower the costs of data communications between the machine modules and the visualization system with MultiPanel 277. The positive experience gathered in this project induced Universal-Pack to implement other machine modules, such as “pick & place” and cartoners, on the same platform. This led to considerable reductions in the development time and associated time-to-market for the new models.